A milk supply debate raged across newspapers in 1918. During 1917, new powers were granted to local authorities in England and Ireland to supply milk to children and expectant and nursing mothers at cost price or free. The Irish Local Government Board gave grants to urban and rural sanitary authorities of one half of approved net expenditure in the cost of milk and dinners provided for expectant and nursing mothers and children under six. The grants were given only when the arrangements formed part of a maternity and child welfare scheme established by the local authority. Dublin, Kingstown, Bray, Monaghan. Clonmel and Cork were noted as good schemes but were not enough to meet demand. Apart from the local government scheme, notable in Cork was the Cork Milk Supply Scheme operated by the Roman Catholic Bishop, Rev Cohalan and local parish clergy. Set up in the winter of 1917, its story is told across minutes of meetings published in the Cork Examiner. The scheme was intended for poor families where there were young children of an age where milk was an important source of food. 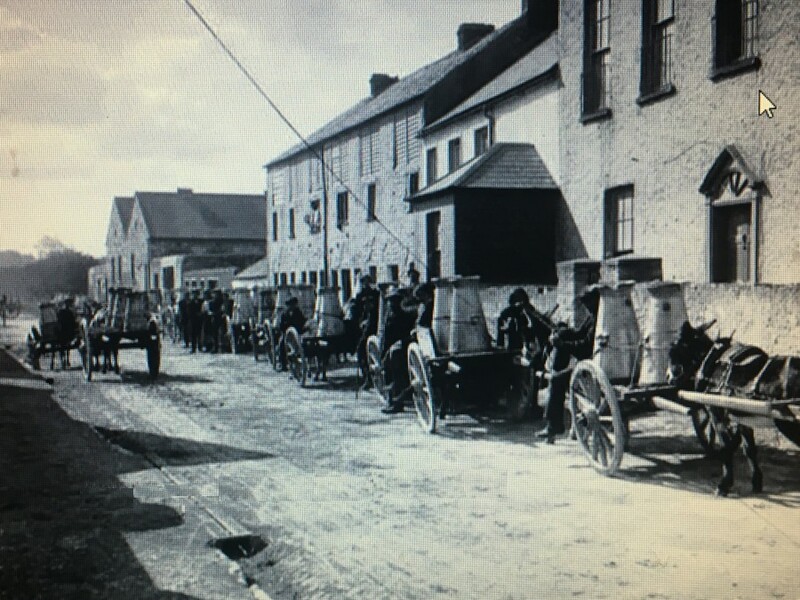 In the early weeks of the scheme, the Cork and Kerry Creamery Company, acting on the initiative of committee member of the scheme, Mr Sunner, supplied to the poor of the South Parish, Cork. Excellent milk was supplied at a very cheap rat of one penny per pint. Subscriptions from local merchants and businesses made up the balance of price to the vendor. At the beginning of the scheme there were 660 families registered to get the milk at the cheap rate, with the figure rising to 965 families by the end of 1917. The income threshold of families interested in the scheme was not to exceed 25s per week, and in the family there were to be children under six years of age. An official register was compiled by the several parish committees. They made sure that the tickets were only given to the necessitous poor, eradicated duplication of tickets, and made sure the tickets went out from one central source in every parish. At an executive meeting on Tuesday 28 May 1918 Bishop Cohalan presided. Mr Pelly, the Honorary Treasurer, stated that there was a sum of about £150 on hand. In view of the fall in the price of milk, the discussion involved debating about the discontinuing of the milk supply. The price of milk during the summer of 1918 was estimated to be 2d per pint, which was near the one penny mark already in place. The Committee decided that the scheme be discontinued except in the case of families already on the lists who had children suffering or recovering from ailments. The quantity of milk to be subsidised by the Committee was to be two pints per family a day. In making out the new lists of families to be relieved, the Parish Committees were to be given advice by the city’s dispensary doctors. On 30 October 1918, a public meeting in connection with the securing of a supply of milk at a cheap rate for the children of the city was held in the Council Chamber, City Hall. Bishop Cohalan told the meeting they were assembled to commence the distribution of milk to the poor families of the city – to continue the scheme inaugurated the previous winter. He revealed that the number of pints of milk distributed between the end of 1917 and 1918 was 203,000. The money received in subscriptions in 1918 was £1,822 0s 6d. The amount expended was £1,745 8s 3d, leaving a balance, wherewith to start the winter of 1918 of £76 12s 3d. Lord Mayor Thomas Butterfield proposed the following resolution: “That we deem it our duty to raise a fund with the object of putting the Cork Children’s Milk Scheme into operation again this year, in view of the inability of many poor families to procure a sufficient quantity of milk for children during the winter months, and especially in view of the outbreak of influenza”. Canon O’Sullivan of the North Cathedral seconded. He deemed that the absence of sickness the previous year in his extensive parish was down to the benefits of the cheap milk supply and school meals. There were 13,000 pints of milk distributed in his parish at 1d per pint, and it was not difficult to realise the benefits that arose in new parishes in the city. At another meeting of the executive committee on 8 November 1918, reports from the different parishes indicated that arrangements were practically complete for putting the supply scheme into operation. An adequate supply of milk was to be put in place for each parish. The committee decided that the distribution of funds would be on the basis of the number of families on the parish lists as follows: North Parish – 400 families, SS Peter and Paul’s – 200, St Finbarr’s – 200; Lough – 70 and St Patrick’s – 60. The families under the scheme were expected to pay 1 ½d per pint for the milk and were to be entitled to receive two pints per day.